M.L. King, on the back center-right, West 9th Avenue, on the right, and the Blue Goose Hollow Trailhead are seen near the Cameron Harbor area on Monday, Feb. 12, 2018 in Chattanooga, Tenn. The M.L. King extension would form a straight shot to the Blue Goose Hollow trailhead, and the old West Ninth Avenue would disappear. 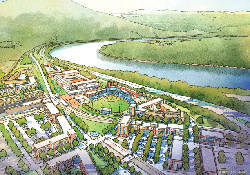 Satisfied at last that tax money won't pay for private development at upscale Cameron Harbor, Chattanooga City Council members on Tuesday approved tax-increment financing to extend M.L. King Boulevard across Riverside Parkway to the Tennessee Riverwalk. Council members voted 8-0 to approve an economic impact plan for the M.L. King Boulevard development area and to allow Mayor Andy Berke to execute the TIF agreement with Evergreen Real Estate, the Cameron Harbor master developer. Chairman Jerry Mitchell was absent. The tax-increment financing plan will raise money to build the road, a broad, landscaped entry to the Blue Goose Trailhead at the Riverpark, and for improvements to another city street near the riverfront. Initial versions of the proposal also included $500,000 to subsidize rents at 36 apartments for workforce housing, but council members balked and the mayor's office said the added cost made the TIF too costly to repay. Tuesday's vote came after Councilman Chip Henderson made clear from the dais that tax revenue would be used "exclusively" for public infrastructure. He was the only one to comment before the vote, but Councilman Darrin Ledford said afterward that the city had worked with the council to polish the proposal. "As a small business owner, I understand the use of financing tools to achieve short-term and long-term objectives," Ledford said. "I discussed my concerns with Mayor Berke, and although I believe no TIF will ever be perfect, changes were made that more accurately reflect our adopted TIF policy. The focus of [tax dollars] dedicated solely to the public infrastructure and not private investment is very important to me." The Hamilton County Commission also must sign off for the TIF to go forward. Commissioners are expected to get their first briefing on the plan next week. The TIF plan will allow Cameron Harbor's developer to take out a $3.5 million construction bond for the road and be repaid over 15 years. Repayment will come from money that would have gone for property taxes on four buildings — a restaurant, a medical office, a mixed-use building and an apartment building — in Cameron Harbor. The 15-year payout, including interest, is $5.2 million. Critics such as watchdog group Accountability for Taxpayer Money said from the start the road project didn't meet the city's own rules for tax increment financing and questioned whether any of the TIF money would be used to benefit Cameron Harbor. The critics, led by ATM founder Helen Burns Sharp, say the city could use other funding at less cost for the road. When the plan came before Chattanooga's Industrial Development Board meeting earlier this month, city economic development official Charita Allen said the city had ruled out other options, such as dipping into the city's Alstom settlement, issuing a bond, or using money from the 21st Century Waterfront fund or hotel-motel taxes. Allen said TIF rules did allow the road because it was included in city development plans going back decades. The council vote came on the same day as the release of a proposed multimillion-dollar revitalization plan for the South Broad Street area that also is intended to be funded though tax-increment financing. Eric Myers with the Chattanooga Design Studio gave council members a slide presentation during their afternoon agenda session but didn't mention the financing method. Local resident Tresa McCallie pointed that out at the night voting session, coming up to speak to the council during the public comment period. McCallie said she'd participated in the design studio's expansive public planning process and hadn't heard any mention of TIF financing until she read the Times Free Press' online story Tuesday afternoon.